The picture is painted in oil on canvas in 1913. 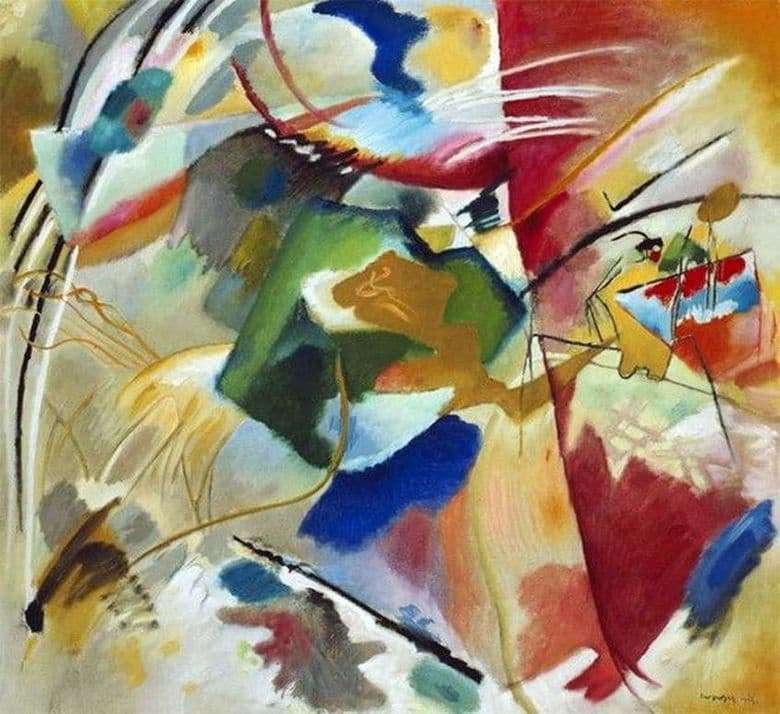 The work with the green center of Vasily Kandinsky has a traditional compositional construction. The artist builds the depicted composition from the center. This is the way the image of many works of the master is written. In the present work, the centerpiece is a green figure. A figure of indefinite form, not closed. The picture is written in the spirit of symbolism. Each applied color was used by the master as a definite symbol that evokes certain feelings in the viewer. For example: a cold blue tint symbolizes coolness, causes association with the sea, ice, moonlight, or illuminated darkness; the green color has many shades, due to which it receives a special depth of sound in the work, symbolizes calm, plays the role of a neutralizer between yellow and blue shades; red is associated with fire and blood, symbolizes internal movement; the abundance of yellow in the picture, gives the work of the artist dynamism and symbolizes the irresistible desire for anything. Many important role in the picture has a combination of color composition. The content of the picture complements the contrasting colors: red and green, blue and yellow, black and white. The game of color is made by the master brilliantly and very harmoniously. Each shade has its expression in an intricate form. The combination of shapes and colors, gives the viewer the illusion of vibrating modulations that, when viewed, are felt even physically. The masterly construction of the elements of the image, ideally chosen color combination, makes the product a masterpiece. Looking at the picture with the green center, we can conclude that its author is brilliant, because, like none of the followers could write such a masterpiece.